A standard Boyce MotoMeter on a 1913 Car-Nation. A standard Boyce MotoMeter fitted together with hood mascot. 1926 Packard Six model 226. 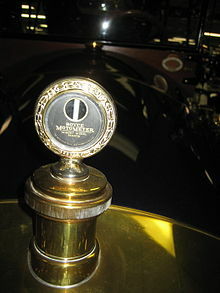 The Boyce MotoMeter was patented in 1912, and was used in automobiles to read the temperature of the radiator. From then through the late 1920s, the Boyce MotoMeter Company in Long Island City, New York, founded in 1912 by the German immigrant Hermann Schlaich, manufactured a variety of different models which varied in size and design. The non-pressurized Thermosiphon cooling systems that were widely used until the 1920s led to a low boiling point. The Boyce MotoMeter was a simple device. Although it not always warned about engine overheating in time to prevent damage, it offered for the first time information about the engine temperature from the driver's seat. Motometers were at first aftermarket devices. Later, vehicle builders (not only car manufacturers) began to offer them as standard or optional equipment, and dealerships began to offer them, too, sometimes as give-away or incentive items. The MotoMeter Company soon delivered these with metal dials inside that showed the make's or dealer's logo and script printed on it. The standard motometer came in three sizes for small cars, medium cars, and large cars and trucks. There were also slight changes to each of the original models and new designs and accessories like hood ornaments, toppers, illuminating devices or locks were added to the line of meters while some others were discontinued. Toppers are small metal castings that fit to a bracket on the motometer. They were used in a similar way as modern decals showing the vehicle owner's heritage, profession, preferences, or support his business, his preferred sports, or even a political statement. Toppers were also offered by other novelty producing companies, Ronson among them. Boyce kept several patents on its products and fought infringements. By 1927 the company was offering a wide variety, but the motometer became soon obsolete when dash-mounted temperature gauges appeared around 1930. Boyce had such a device patented as early as 1917. There were many manufacturers of engine thermometers; they used different, and sometimes complicated, designs to get a reliable and accurate gauge. Great Northern Sales Co., "Bemometer"
G. H. Morden Co., London, "The Morden Indicator"
Wikimedia Commons has media related to Boyce MotoMeter. Official Website of IVEKA Automotive Technologies Schauz GmbH, the owner of the MotoMeter trademark. Boyce MotoMeter at MotoMeter Collector. Boyce MotoMeter at Mascot-Mania.com: . prewarbuick.com: Reaching the Boiling Point - A History of Boyce Moto Meters by Victor Koma. Motometer: Jubiläumsbroschüre (PDF; 1,9 MB), German. A Boyce MotoMeter on a 3rd series Packard Six (1926). ^ MotoMeter: Imagebroschüre 1912-2012, p. 3-4 "Ein Schwabe in New York".